What does it mean to be “responsible”? Make up your own definition and then compare it to a dictionary definition. Look at a dictionary that includes the etymology of words (where words came from and how they have changed in meaning over time). What do the roots of “responsibility” tell us about its meaning? 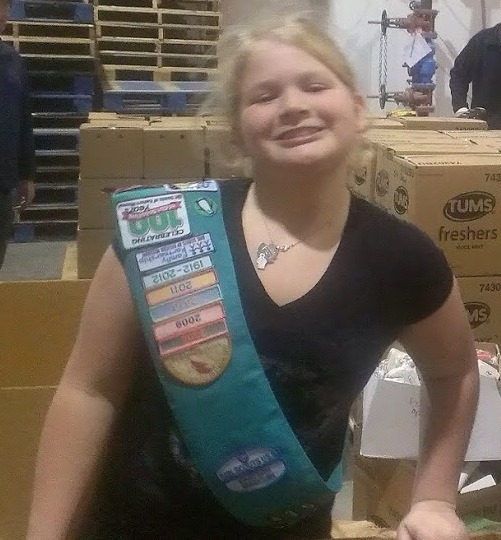 Anne, 12 years old, sorting donated items into packages for distribution to local food pantries. Tell how your responsibilities have changed as you have gotten older. What does it means to “make amends”? Learn about Yom Kippur, the Jewish Day of Atonement. Find out what people do to observe this holiday. Why might it be good for a community for people to “atone” at least once each year? Describe a time when you said or did the wrong thing, or made a promise and didn’t keep it. How did you help “fix” the situation? If you didn’t fix it then and it’s not too late, how could you fix it now? What would you do if you had a “do-over” for that situation? Girl Scouts of the USA makes no attempt to define or interpret the word God in the Girl Scout Promise. It looks to individual members to establish for themselves the nature of their spiritual beliefs. When making the Girl Scout Promise, individuals may make wording appropriate to their own spiritual beliefs for the word God (p. 22). Girls of all religions are welcome in Girl Scouting, and so, to reflect her faith a girl may substitute another word or words for “God” (for example, “Allah” or “good,” or something else) or simply promise “to serve.” Unitarian Universalists have many different beliefs about “God,” so this choice is very important to us. Since Unitarian Universalists are allowed to change their beliefs over time, UU Girl Scouts might make this decision differently over time. Think about how this choice relates to you. Think about whether you would like to say the Promise the traditional way or say it differently. Would you like to say it the same way all the time, or different ways on different occasions? Is there anything you might want to say instead of “God” that better fits your beliefs? Discuss this choice with your parent or caregiver.